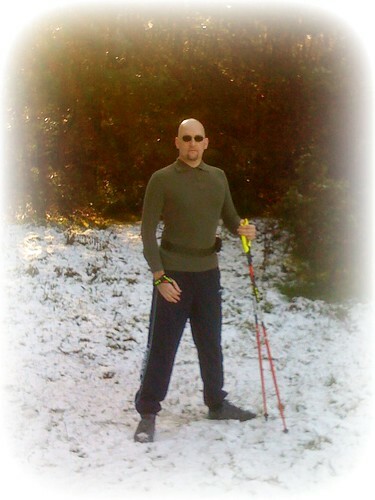 I’m talking poles again… and not the dancing type you’d find in a “gentleman’s club” – I’m talking about Nordic Walking. This is a review of sorts – or at least as much as I can at the moment. Nordic Walking is something that the Physiotherapist and GP have said I should do (See here – earlier Back Injury blog), but with the wet leaves and foot design of my first set of Nordic poles I didn’t want to risk going for a walk. One slip and I would end up in a boat load of pain and putting my rehabilitation back – Nordic walking may be good for repairing my slipped disk, and it gives me some supported freedom and a break from looking at the ceiling – but there are limits when you have a trick back. My original poles had a foot and spike design that just wasn’t sure footed, but luckily for me LEKI have a foot design that works well on wet leaves, dirt, tarmac and most other surfaces. Ardblair Sports Importers, through “Tortoise and the Hare” running supplies came to the rescue. They supplied me with a new pair of poles with attachments to help keep me walking in all conditions. (See bottom of this report for their details). Today I took my first trip out (a gentle 6km) with these new poles and feet. 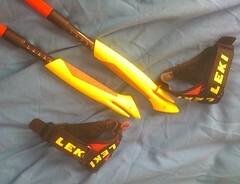 The poles are LEKI Speed Pacer Vario Carbons. They are 100% carbon poles with a 10cm adjustment at the very top. This means I can adjust for different types of Nordic walking (fast, slow, soft ground, etc), and this is why an adjustable pole from a reputable supplier and manufacturer is the best buy for the all round walker. These particular poles are each rated to 140kg load and meet the top criteria of pole design – better than many fixed one piece poles. I’ll start at the bottom, seeing as I have already mentioned the foot design. It is a sloped gripped rubber “boot” that makes the most contact on smoother roads then the flat ended hiking pole type pads. Nordic walking is about “pushing”, and as such, the poles are mostly behind you and at a steep angle to the ground – hence the need for the sloped boot. The standard boots don’t have the studs as seen in this picture, although they still have the deep cut rubber grooves. 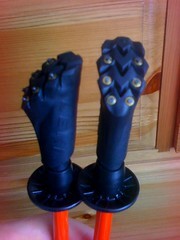 These studded boots are LEKI’s new “Silent Spike” design. These studs are much quieter on hard surfaces than just using the spikes, and have the advantage over the stud-less design as they bite through the wet leaves and foliage. This makes them great if you are walking over a wide variety of terrain in one go. Other manufactures smooth bottom boots just don’t cope on a tarmac and scattered foliage surface. The LEKI Speed Pacer Vario Carbon Pole itself is a very high strength, incredibly light weight 100% carbon pole. The swing is well balanced and for me with my back injury I felt that these poles made walking even more comfortable than my previous aluminium poles. I can see in the areas of lacquered but otherwise naked carbon weave that the manufacture of this pole is very high quality. It is not just some cheaply thrown together pole. Coupled to this light weight full carbon pole is a tested and certified adjuster right under the hand grip. It is only a 10cm adjustment, but that is spot on for a pole that only one person will be using. Instructor poles have a larger adjustment range which allows the poles to be set up for different height users. In my case, I only wanted something that would adjust for the different walking styles and conditions I will encounter, so a 125cm to 135cm pole is perfect for me. The lock design is all part of that TUV tested 140kg per pole load certification. Having the adjustment at the very top of the pole also aids balance and strength. Many other adjustable telescopic poles have the adjustment parts lower down, and as such the balance and swing can be affected. By placing the adjustment at the top it leaves a longer (and stronger) one piece lower section with superb balance qualities. It’s also in this adjustment area at the top of the pole that you can see the meticulous manufacturing that has gone into the carbon weave alone! This is a well designed pole – both functional and attractive. I have a pet hate with my older poles. The hand grip and “glove” are all in one. The “glove” is actually a wrist and hand support that you wrap around your hand and is attached to the top of the pole. It is vital in Nordic walking, as it is through this that the backwards pushing force is applied. On a pole with the glove permanently attached, it means once the poles are strapped to your hands, you can’t easily do anything other than walk. You need to unstrap if you need to do anything else. These new LEKI poles have a great “Shark” design. It is a strap/glove with a sewn in tough cord loop between the thumb and first finger. The loop slips into the “shark mouth” design jaw and locks in place. By pressing the button in the end of the grip this strap can be removed easily without actually unstrapping the glove from your hand. This is a major plus point, as it means the poles can be quickly released from your hand if you need to answer your mobile phone, grab a water bottle, tie your lace etc. The shark mouth and loop design is very tough, very positive and very quick to operate – Top design work. The handle itself is a thin cross-country style grip. It is designed to swing between your thumb and fingers during the forward pole swing. As mentioned earlier, the gloves are designed to push the poles back, and in the poles most rearward position, the walker actually opens their hand, lets go of the pole and all the force is on the glove. As the pole swings forward again it should slip easily back into the users hand. A bulky grip would mean having to hold your hands wide open on forward swings – and it would just get in the way. Today’s walk was over gravel, tarmac (with dry and wet leaves covering), sand, mud and loose packed forestry roads – add to this the snow and you can see that these poles had a good testing over the 6km. I felt very stable and secure with these LEKI poles, and the “Silent Spike” boot was fantastic over varying terrain. I did cover some distance without the boot on, and just used the bare spike. Even the LEKI spike is of a design that holds very well – even on smoother surfaces. 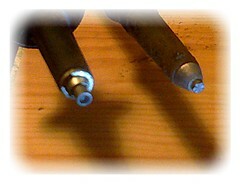 If you take a look at the picture, the LEKI spike is on the left, with my old pole on the right. As you can see, the old pole had a metal spike that looked like a 5mm round meat tenderiser – it looked grippy, but really didn’t do much. The LEKI “Hollow point” looks the slippier of the two designs, but actually bites in a lot better. All in all, the LEKI Speed Pacer Vario is a superb pole. Very well balanced, very strong and incredibly light – and the adjustment system is just enough for a user to be able to set up for all types of Nordic walking. The Silent Spike boot is great – perfect for those walks over varied terrain or slippery tarmac where the walker doesn’t want to keep putting the boot on and off – and it really is quiet. I can’t wait for my back to be fit enough again so I can go out and really put these poles under pressure. There are some great hills and steep climbs to be had nearby – and some streams that are crying out to be bounded over with the poles – and as these are so highly rated and certified, I have full confidence in their ability to take more than I can throw at them. If you want to order some Nordic poles or other running equipment and you want good advice from people who know what they are talking about, then contact “Tortoise & the Hare” on 01483 273372 – or visit them at 6 Smithbrook Kilns, Cranleigh, Surrey, GU6 8JJ. 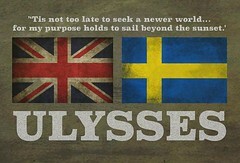 Their website is www.tortoiseandthehare.co.uk. Tell them I sent you and there could be a discount waiting for you – I’ll update this blog with more details on that shortly. If you are are a store owner and you want to sell LEKI poles (among other equipment), then contact Ardblair Sports Importers via their website, or call 01250 873863.